My kit is out of production. It has a copyright date of 1969. There is a 1995 re-release of the kit for sale by a guy in the Netherlands for 15.00 eur. Virtually every theater of operations witnessed the performance of the almost 10,000 Airacobras that were produced during WWII. Armed with a deadly cannon firing through the hollow propeller shaft and an array of six machine guns, the pesky little fighter packed more fire power than any other single-engine aircraft of similar size. The unorthodox design features incorporated in the p-39 were conceived as early as 1936, when Bell Aircraft engineers addressed themselves to the task of designing an aircraft they considered to be the ultimate in air warfare. By locating the Allison V-1710 12 cylinder, liquid cooled engine behind the cockpit near the center of gravity and driving the propeller through an eight foot extension shaft and reduction gear box, the nose section was made available for the installation of heavy armament. Accurately foreseeing the need for superior ground handling and visibility requirements, a tricycle landing gear and large cockpit glass area were used. These features proved to be of immense importance later, when the Airacobra's were called upon to operate from makeshift wartime airfields. Following the first successful flight of the prototype XP-39 in April of 1939, the Airacobra was to continue rolling off the assembly lines until production ceased in August of 1944. During this time the P-39 evolved through 21 different model designations terminating with the P-39Q-30. Being of relatively small size, the Airacobra had a wing span of 34 feet and a length of 29 feet 2 1/2 inches. It could attain a maximum speed of 368 mph at 13,800 feet and had a range of over 600 miles. In addition, to two .30 caliber machine guns carried in each wing, the nose section house two more .30 caliber machine guns firing through the propeller arc and a shell firing cannon (20 mm or 37 mm) depending on version. Though originally designed as a fighter, the Airacobra demonstrated its versatility by performing almost any task demanded of it. Its rugged construction and devastating fire power were used to their greatest advantage by the Allies in low level, close-support work. It also saw service as a dive bomber and the Russians used it extensively on the Eastern Front as a formidable "Tank Buster". Monogram is a old prolific model company based in Morton Grove, IL. They manufacture all manner of model subjects in the popular scales. In recent years they have become associated with Revell. When this kit was released they were a subsidiary of Mattel Inc. The parts and information contained in this Monogram kit will enable modelers to build any one of four realistic models of the P-39. 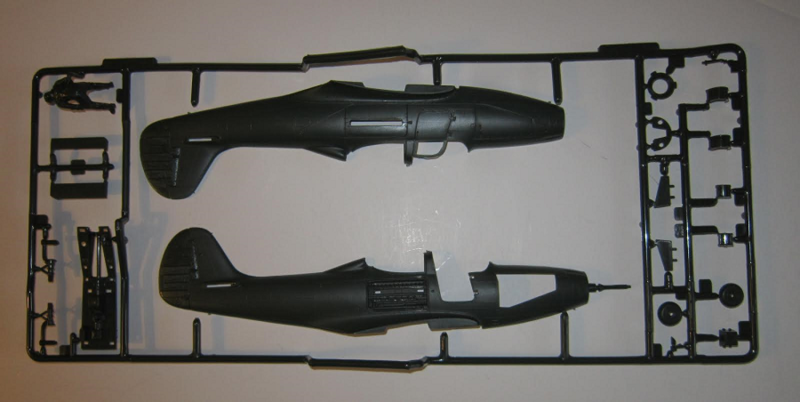 Before beginning the assembly of the model, modelers are to refer to the painting and decaling instructions on the back page of the instructions and select the version they want to build. Also, not the variations indicated and plan work accordingly. The box art shows a color painting of a P-39 on a South Pacific airfield with 2 maintenance men working on it. It is olive-drab over a light-gray undercarriage, with a shark face on the nose, white spinner and wing tips and a white 13 on the rudder sides. There is a black and white character of a Hindu snake-charmer on the side of the box art. One side panel of the box has a small color illustration of a Soviet P-39. It is in a wave pattern of medium-brown and dark-green over a light-gray undercarriage, with just the Soviet stars on it, followed by a one-paragraph history of the plane, over Monogram's street address in Morton Grove, IL. The other side panel has another photo of the Soviet P-39 and a description of the model options. 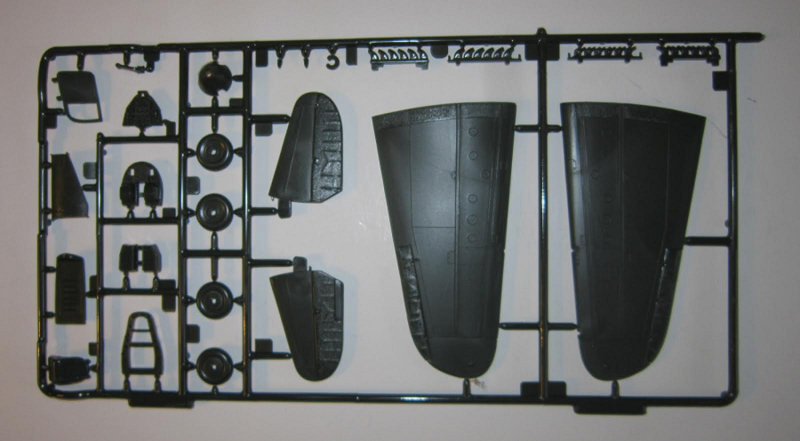 This kit contains 3 olive-drab parts trees, a clear tree, decal sheet and instructions. Parts trees are not cello bagged. Trees are not alphabetized or illustrated in the instructions. They do have part number tabs next to the parts on them. This means searching the trees to find the correct parts for each assembly step. Bad move Monogram ! 1. A P-39D-1 version, that is olive-drab above a neutral-gray undercarriage. It has a narrow white fuselage band and black U.S. ARMY below the wings. 2. A P-39D-2 version that is olive-drab above a neutral-gray undercarriage too. It has a white 18 on the sides of it's nose and a yellow serial no. 135405 on the sides of the rudder. 3. A P-39L-1 version, that is the same color scheme as the previous two, with just Soviet stars on it. The history of the P-39 is down the right side of the page. Page 2 through 4 give a grand total of 5 assembly steps. Pages 5 & 6 are the painting and marking instructions. Page 5 has a 2-view of the Soviet version. a profile of a P-39D-1, which is olive-drab over light-gray with a white 56 on the nose and Y135400 on the rudder sides and a white narrow fuselage band. 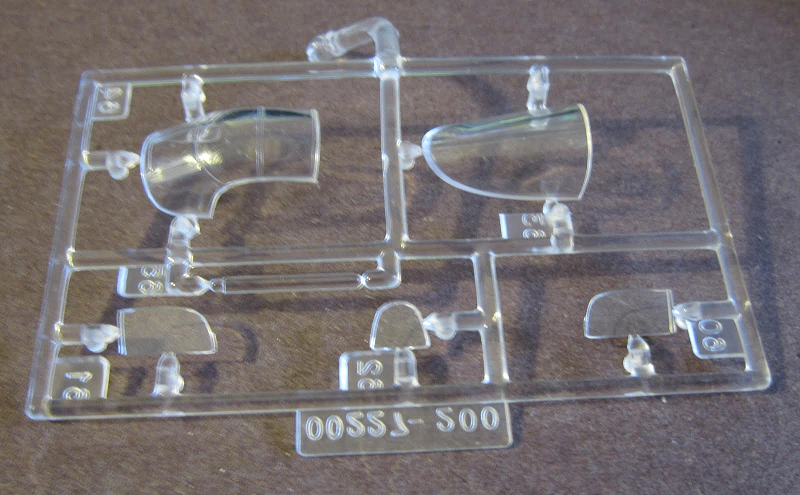 ​The clear parts consist of 6 cockpit windows. Nicely detailed kit with raised panel lines. Flaps are all molded solid.